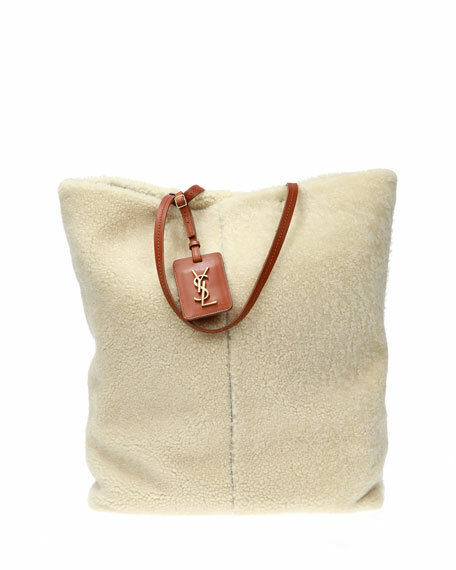 Saint Laurent tote bag in dyed sheep shearling (Norway) with leather trim. Flat shoulder straps with hanging logo tag, 9" drop. 16.5"H x 13.8"W x 4.7"D.
Liberty London printed coated canvas tote bag with neon colorblock leather trim. Flat top handles, 2.8" drop. Removable, adjustable shoulder strap, 22" drop. Open top with snap closure. Exterior, side snaps expand bag. Interior, logo-jacquard lining. One slip pocket. 7.5"H x 9.1"W x 3.1"D. Imported.